My Augusta friends are coming tonight! YAY! Tomorrow we’re heading off to an arts and crafts festival(love ’em!). We’re belatedly celebrating a birthday tonight, but they’re already had cake a time or two. So I thought I’d make banana nut bread instead. Jesse doesn’t like nuts in her food, so you’ll see that there are several ways to make it- with or without your choice of goodies. This is a recipe I made up on my own. Although those types of recipes usually tend to be the tastiest, I’m usually not creative or patient enough to find what really works. But, without being too conceited, I think this is the best banana bread recipe out there! Try it for yourself and let me know what you think! Ingredients: 3-4 ripe(read: almost black and ready to head to the garbage) bananas, 1 good splash(about 1 tsp) of vanilla extract, 1 -1/2 self rising flour, 1 cup sugar, 1 egg, 1/3 cup melted butter. Here are all the optional “goodies” I’ve added: 1/2 cup chopped nuts(pecan, walnut, cashews…although the cashews tend to be a little chewy when baked), 1/2 cup cranberries, a handful or two of chocolate chips, you can really put most anything in here! Directions: Preheat oven to 350. Mash bananas. (I have a potato masher, but you can easily use a fork or your hands.) Add sugar, egg, and vanilla flavoring. Mix. Add flour and mix well. Add melted butter, and whichever optional goodies you want. (It’s pretty common for me to add nuts, cranberries and chocolate chips. But remember the more stuff you add, the longer it’s going to take to cook. So don’t add a full 1/2 cup of each one or you’ll have a gooey center when you’re done!) Pour into a greased loaf pan. Bake at 350 for 50-60 mins. 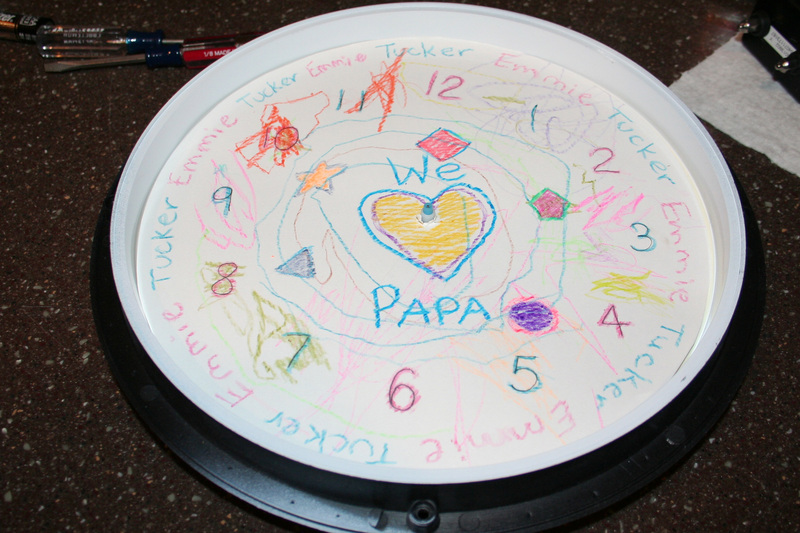 I orginally planned on showing how to make a Photo Clock like you can order from Snapfish and Walmart and Walgreens for about $20, but I didn’t have a photo on hand. So…I decided that the kids could draw a picture instead! 🙂 The whole project took about an hour from beginning to end, but that did include the 20 minutes or so my kids took coloring. 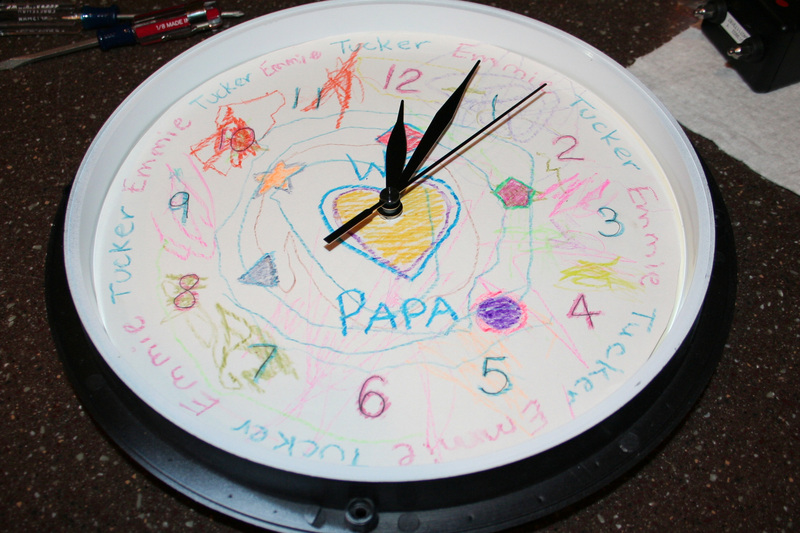 So…you only need a few things: pen, scissors, a large(12×12) sheet of paper, a large photo(based on the size of your clock, you may need an 8×10 or 11×14), a tiny screw driver, and a clock. 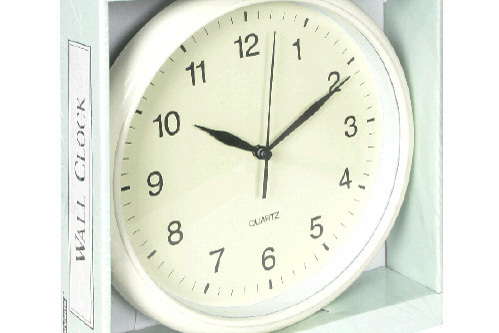 I grabbed a cheap $4 wall clock from Walgreens today(like the one shown below), but you could use any one that has screws on the back…some of the really cheap ones are glued together. I’m going to give you a ton of pictures and a ton of directions…it’s really idiot-proof though. I’m just trying to be really specific. 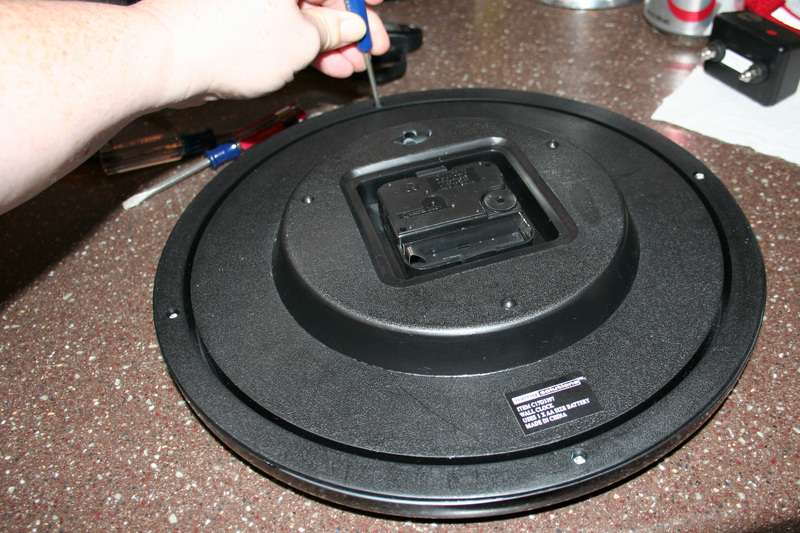 To start, unscrew all the little screws on the back in order to take the glass front off. 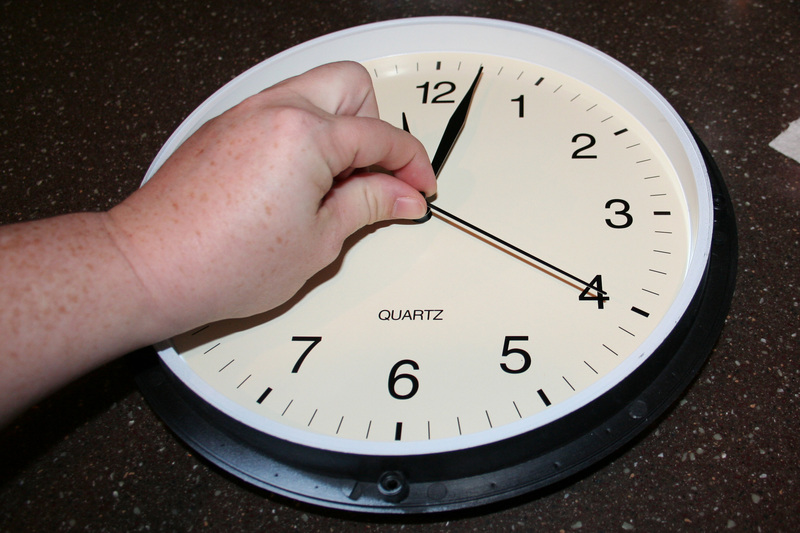 Be sure to set the face of the clock on something semi-soft so that it won’t get scratched. Next is probably the hardest part: You’ll have to take off the second, minute and hour hands. 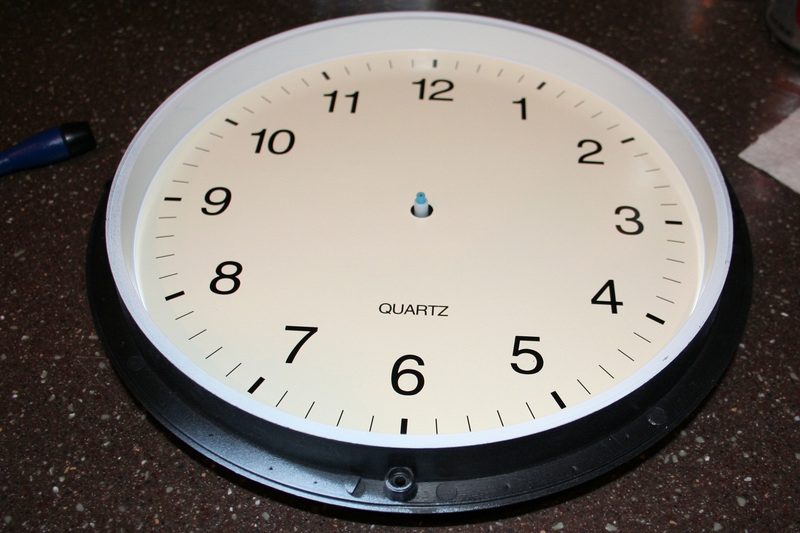 For most clocks, you just have to pull on the second hand and pop it off. Once you get it off, it’s really easy to get the other two. When you’re pulling, you may think that you’re going to break it…you won’t…probably. If you do break it, you’ve only lost four bucks! 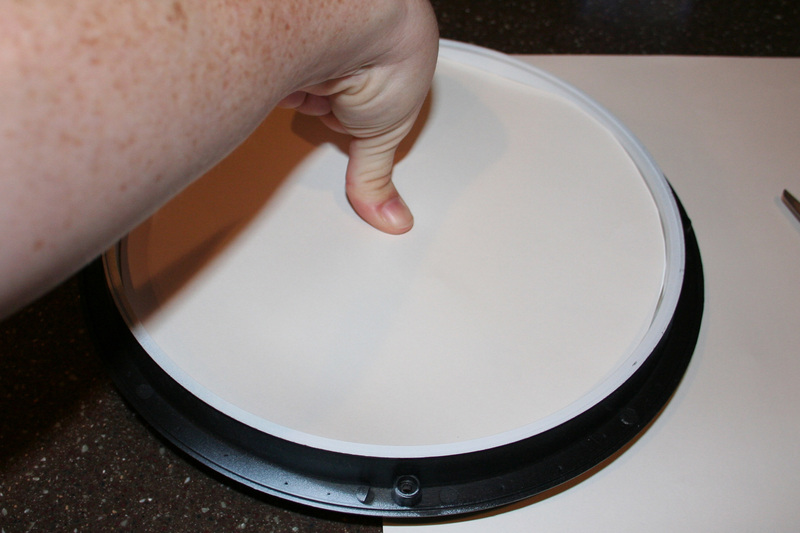 Next you’ll want to turn the clock over and carefully trace the edge of the clock on your 12×12 paper. I say be careful because you’ll have the little center part sticking out. If you break it, you’ve broken the clock. So don’t break it! 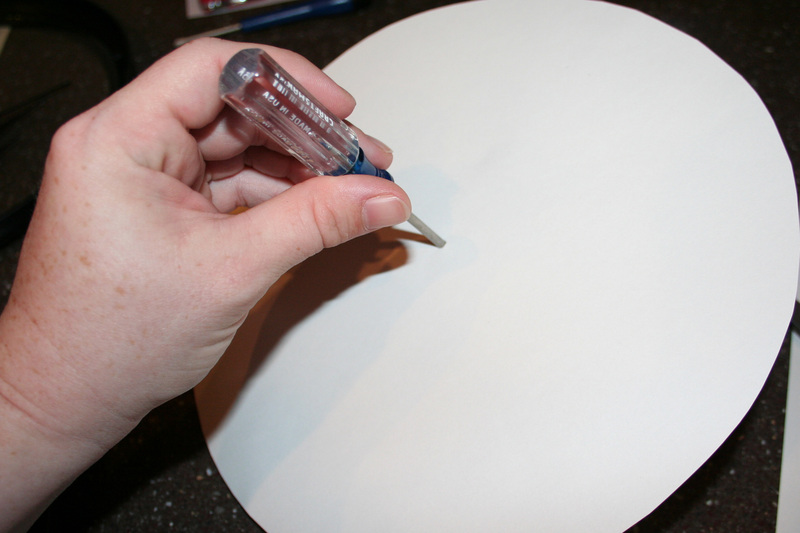 Once you have it traced out, you will cut out the circle. 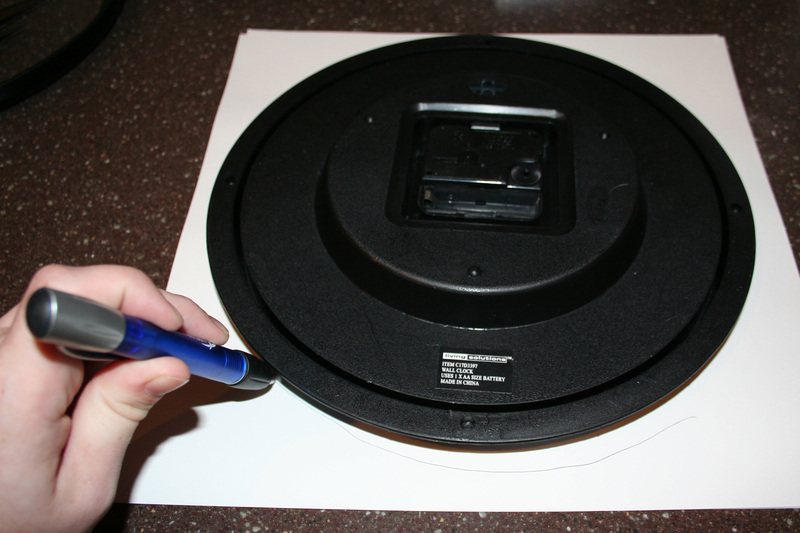 Remember that you’ll also want to trim a little bit off from what you traced because the inside of the clock is smaller than the outside. It’s always better to make it too big than too small though…you can keep trimming it until it fits perfectly. Once it’s all cut out and looks like it’s going to fit, you’ll turn the clock back over. Center the circle over the clock and gently push down on the center post. You probably won’t be able to push hard enough to puncture the paper without breaking the post. So just make an indentation that you can punch out later. 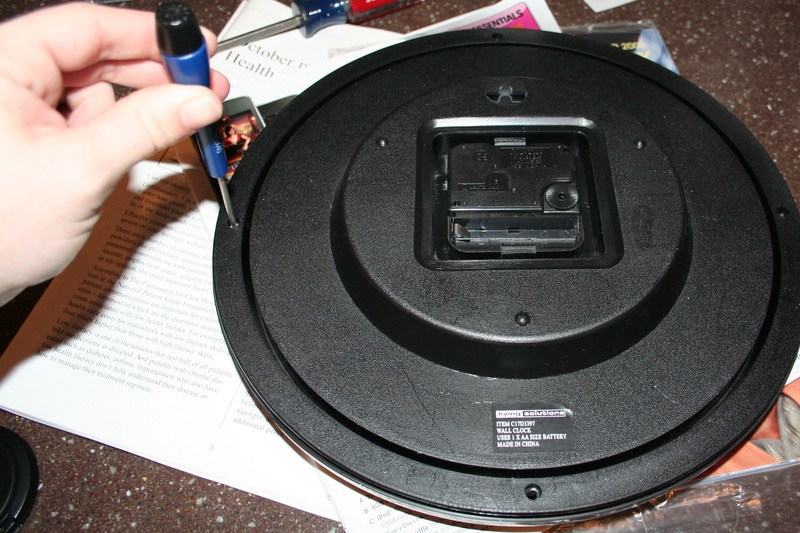 I then used my little screwdriver I had on hand to make a hole where the indendation was, and make it all smooth. You’re getting close now! 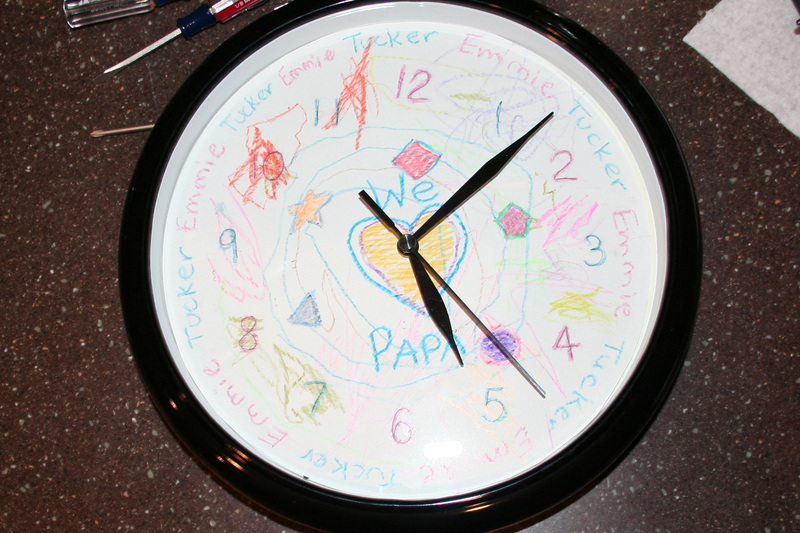 Take your photo or artwork and glue or tape it onto the clock face. I like to use double sided tape, but you could use whatever you have available. Then you’ll need to put the hands back on(usually in the hour, minute, second order). Make sure that they are all flat. If they got bent when you were trying to get them off, they won’t run smoothly. But you can easily straighten them back out. This will be a super fun gift to give my Papa. I’m always trying to find something my kids can make for him, but that he can actually use, too. I still plan on making a photo one for myself. Once I do it, I’ll post that picture, too, so that you can see what it looks like! I barely made the deadline for Nov 6th, but I’m still hanging in there! You promise to keep on reading, and I’ll promise to keep on posting!